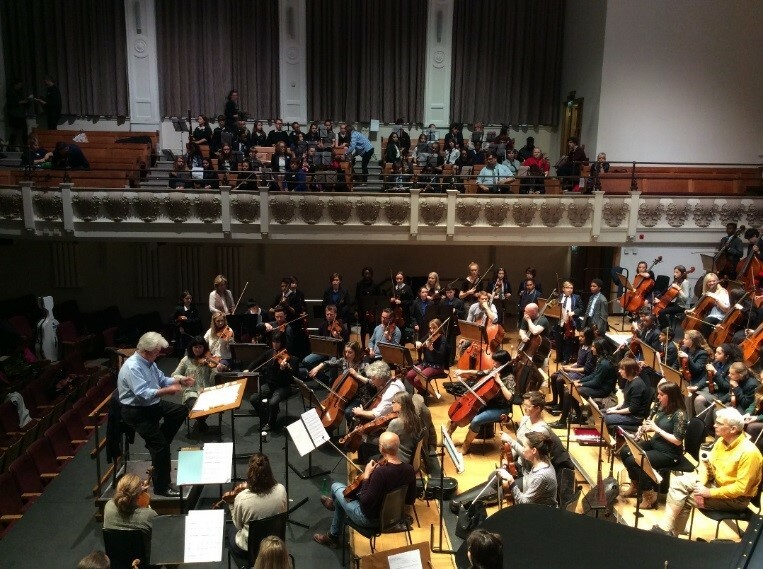 The LCO Music Junction Project is a creative, collaborative project in which TGS, Skinners’ Kent Academy and Meadows Barnardo’s School compose and perform music with musicians from the London Chamber Orchestra. The project culminates in a concert at the Cadogan Hall in London each year. The concert presents performances from the LCO and features the Music Junction Showcase composition. This year the concert took place on 5th May 2017 with a composition by Paul Max Edlin entitled Simple Gifts. The project involves a small invited group of TGS musicians as performers and as mentors, working alongside less experienced musicians from the other local schools. The TGS musicians perform with the LCO. Each year a ‘Flash Mob’ performance takes place at each of the schools involved with all TGS participants taking part. In 2017 the tune Simple Gifts was performed by LCO Music Junction musicians and all TGS Year 7 students. The piece was also performed at the 2017 Spring Concert as a new Kent hub collaboration. TGS has been involved with the LCO Music Junction Project since 2010 with 10-15 students participating each year. The project involves the composition of a new piece each year. A composer and members of the LCO outreach team visit twelve schools in four hubs in London and the south-east and develop the piece through composition and improvisation workshops with students. The project aims to nurture greater empathy and connection between young people from different backgrounds. By bringing together children and young people who would not usually meet, and giving them shared opportunities to make music as a group, Music Junction promotes confidence, nurtures self-esteem and encourages participants to develop respect for themselves and each other within their wider communities. This year’s composer Paul Max Edlin has partly taken his inspiration from the connection between Music and Science – in particular he celebrates the invention of the light bulb, which took place in 1848. 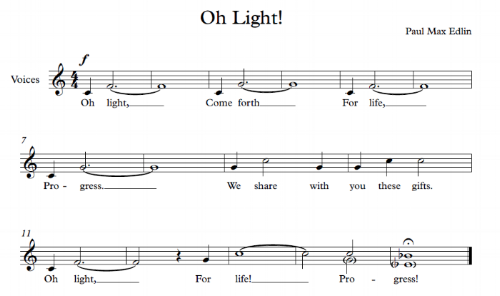 This provides a subtext for the opening fanfare O Light! (with words by Music Junction participants). The piece further explores scientific invention and exploration with the ‘Space’ section which forms the central section of the piece which was performed at the TGS Spring Concert in a reduced version for LCO participants from Meadows Barnardo’s School, Southborough. TGS is proud to be working alongside Meadows School and Skinner’s Kent Academy in this fantastic project. Another feature of Edlin’s piece is the incorporation of Shaker tune Simple Gifts (written by Joseph Brackett also in 1848). It is better known today as the tune Lord of the Dance. The words of the song are below, and they provide a positive message for today, reminding us that the most important things in life are simple, and not to over-complicate our lives. The Simple Gifts melody also forms part of the piece Appalachian Spring by Aaron Copland, which is also featured in the LCO Concert on 5th May. The start of the project was very exciting, and helped us prepare for the final piece later on. The first thing we did was meet everyone else from the Kent hub, which was a group of about 30 people from Barnardo’s, Skinners Kent Academy and Tonbridge Grammar School. There was a range of ages, from about 12 to 17, and ranges in musical experience, as some of us had never played our instruments before. To get to know everyone, we play some games which built our confidence and improvised with our instruments to improve our performing skills. On the day of the concert, we travelled up to London on a coach with Skinner’s Kent Academy and The Meadows Barnardo’s School at lunch time. Once we arrived, we stayed at a nearby school for a while and had the opportunity to talk with our fellow musicians from other schools before rehearsals began. Then we set up our instruments and walked over to the Cadogan Hall for rehearsals. Christopher Warren-Green was there to conduct us through the rehearsals and the concert. We were organised according to instrument group, which opened up the chance to get to know musicians from other schools and help new people. We rehearsed the piece and made any final amendments. Next we were all given T-shirts to wear over our uniform. They were different colours according to what hub the school is a part of: we were in the ‘Kent’ hub, so our t-shirts were green. Then it was the concert! First the LCO played from of their own pieces, then the final piece of the concert was the Music Junction Project’s piece which we all worked on: ‘Simple Gifts’. Hearing the London Chamber Orchestra perform in the beginning was a new experience for me as I have never been to a professional classical music concert before. It was inspirational to listen to because we all aspire to be able to play at a high standard like that one day. Overall, the Music Junction project held a friendly atmosphere and was an amazing opportunity to learn new skills in performance and playing in concerts. I learnt so many new things about composition and classical music, as well as helping people to learn the flute. The concert went really well and we were all so proud of ourselves afterwards. The composition that we played was called ‘Simple Gifts’, and was written by Paul Edlin. It has 5 movements, each of which have a specific meaning. The main theme of the composition was the Shaker melody ‘Simple Gifts’, which is better known as the tune ‘The Lord of the Dance’. The Shakers were a Christian group founded in England in the 18th century, known for their simple style of living, pacifism and gender equality ideals. The song celebrates the simple things in life. This melody was written around the same time as the birth of Thomas Edison – who developed the motion camera and lightbulb, and therefore the piece celebrates inventions which we have come to take for granted in modern day life. The first movement is called ‘Circles and Symmetries’, and explores the melody through the circle of fifths. The second movement is called ‘The Creation of Artificial Light’, and builds up throughout the movement to the invention of light at the end. Through the unusual notation used, a sense of electricity is built up. The third movement, ‘Velocity and Speed’, imitates trains, through percussion and accelerando. The fourth movement is called ‘NASA and the Golden Record’, and we worked together in our hubs to create short pieces, which were the main section, which in our hub’s case included Star Wars, Mars, and a waltz. This was intended to recreate the Golden Record, a record that NASA sent into space with sounds of Earth and music on it. Other hubs either based their short piece on this, or on space sounds – which we heard through recordings of space which NASA has made. The last movement is called ‘Simple Gifts’, and it is the original shaker melody, played and sung by everyone, even including some audience participation. Throughout the piece there were opportunities for those with varying ability, and it was interesting to see all the many layers come together at the end.